The mystery and allure of ancient Egypt is yours for the taking with this Pharaoh pendant. Or, as my friend asked me this summer, "Why do you have some random dead guy's face on your necklace?" No matter what, it's a lovely piece, and it will shine even brighter when you create a masterpiece around it. It measures 1 7/8" (47mm) long and 1 3/8" (31mm) wide, and the photo is protected under a thick raised epoxy layer. Design tip: Ancient Egyptian jewelry often used red jasper, green malachite, lapis lazuli, and especially turquoise. It was common for artisans to use glass and other faux materials in jewelry, so you don't need to break the bank to create something fantastic! The pendant is shown as part of a larger piece for example only; this listing is for one pendant by itself. The Bead and Bean accepts wholesale orders; please email me if you're interested in discount pricing for purchases over $150. 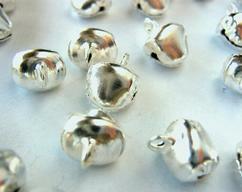 steel bells silver 10mm 100 ct.